For the most part, quartz watches, from a $40 Casio at Target to an Omega Aqua Terra quartz, run at about plus or minus 15 seconds a month. For some people that’s plenty accurate. For certain type of watch enthusiast demands far greater levels of accuracy. Welcome to the world of high accuracy quartz or high end quartz, generally categorized as watches that are specified to plus or minus 10 seconds a year. Thermo-compensation allows these watches to maintain a stable rate in spite of temperature changes. At a very fundamental level, by passing a current through a tuning fork shaped crystal, vibrations are generated powering the watch. By regulating motor pulses in accordance to ambient temperature shifts, a higher degree of accuracy is achieved. As a Worn&Wound reader, you are probably more than OK with about a variance of 10 seconds a day with your mechanical watches. Of course, many of us are fine with even being minutes off of the exact atomic clock time. Even trains don’t leave stops exactly on time. As much as we romanticize the old-world art of mechanical watch movements, there’s something just plain cool about the other end of the spectrum–a watch that allows for such extreme precision. A practical use of a HAQ watch is for knowing you are on time for work-related events. Even if you are late out the door, you can grab your quartz dress watch and know that you are not late for a conference call with your colleagues on the other side of the globe. For the purposes of this guide, we’ll leave out watches that are synched to radio tower signals as well as non-standard battery powered quartz watches such as Citizen’s Eco-Drive line. This is a guide to traditional lithium battery-powered watches that can attain an astounding level of accuracy. I’m also capping the price point, as this is Worn&Wound, so I won’t be covering Breitling’s Super Quartz series, which start at around the $4,000 mark. This is a snapshot of options should high accuracy quartz pique your interest. Of course we begin by talking about Japanese offerings because Japan is known as the birthplace of quartz watches. The Citizen CTQ57-0953 Chronomaster, nicknamed simply “The Citizen,” is the king of high accuracy watches and is unofficially said to be the most accurate watch ever made, with its A660 movement claiming a rating of plus or minus five seconds a year. It features 37mm case width, a coated titanium case and bracelet, independently adjustable hour hand and a perpetual calendar (good until 2100). It’s a Japan-only model, which can be ordered from Higuchi Inc. It retails for around $2,300 (depending on how the exchange rate is) and is what HAQ fans dream of feature wise. You basically don’t have to adjust this watch much during your ownership period. On the other side of the Japanese HAQ is other brand Seiko, the creator of the first production quartz watch in 1969. Let’s start off with the fact that the watch company grows its own crystals (which serve as oscillators for the electrical current) to use with their 9F series quartz movements. The 9F series (originating in 1993) uses a twin pulse control motor, which allows larger hands to be powered without compromise in battery life, the movement has a sealed cabin to protect from debris contamination during battery changes, and it boasts an accuracy of +/- 10 seconds a year. The 9F quartz has an anti-backlash mechanism to eliminate the wobble when the second hand stops. It also has an auto-adjust mechanism, which helps the second hand hit the dial markers spot on. One of my favorite models is the SBGX063, which stands out with a complex champagne dial, dauphine hands and 37mm case. At around 10mm in thickness, the size and proportions make this line a smart fit for the office, taking you from a suited new business pitch to Happy Hour. This case also comes in dial variations of black, white and blue. The anti-magnetic sports model SBGX093, which is like a Milgauss for the Japanese watch lover, possesses a resistance to magnetism at 40,000 A/m and a 38.8mm case. What’s nice about the quartz Grand Seiko models is that they are, on average, 3mm thinner than their automatic counterparts. The SBGX093 and its white dialed cousin, the SBGX091 have a distinctive chunky case shape, just a bit of lume on the hands and dial, and a screwdown crown with 100 meters of water resistance. Domestic Grand Seiko authorized dealers include Arizona Fine Time, Timeless Luxury Watches and Topper Jewelers. Reputable Japanese Domestic Market dealers like Higuchi and Chino generally offer lower prices. Bulova is a company that has set the standard for highly accurate quartz watches that feature, for real, a sweeping seconds hand to satisfy the collector whose only reason to shun quartz is the lack of a smooth moving second hand. For the diver HAQ watch, my choice is the Accutron II Snorkel model (along with the company’s Precisionist line) use a 262 kHz UHF (Ultra High Frequency) quartz movement. Bulova is credited with world’s first watch with an electronic tuning fork (but not battery powered) and hands that were powered by an electronic gear train in 1960. This innovation set the stage for the quartz watch. This model offers vintage diver styling, a 43mm case, a substantial Milanese mesh bracelet, along with 200 meters of water resistance for $260 on Amazon. The Tissot PR 100 COSC quartz watch uses an ETA F06.411 “Precidrive” movement to achieve its status as a HAQ watch. Listed at $575 (available for $455), the model comes in three looks, with the black-dialed stainless-steel version looking the most elegant with the leather crocodile band. The 9mm thick, 39mm case makes it very versatile, able to serve as a casual watch that can handle dressier occasions. 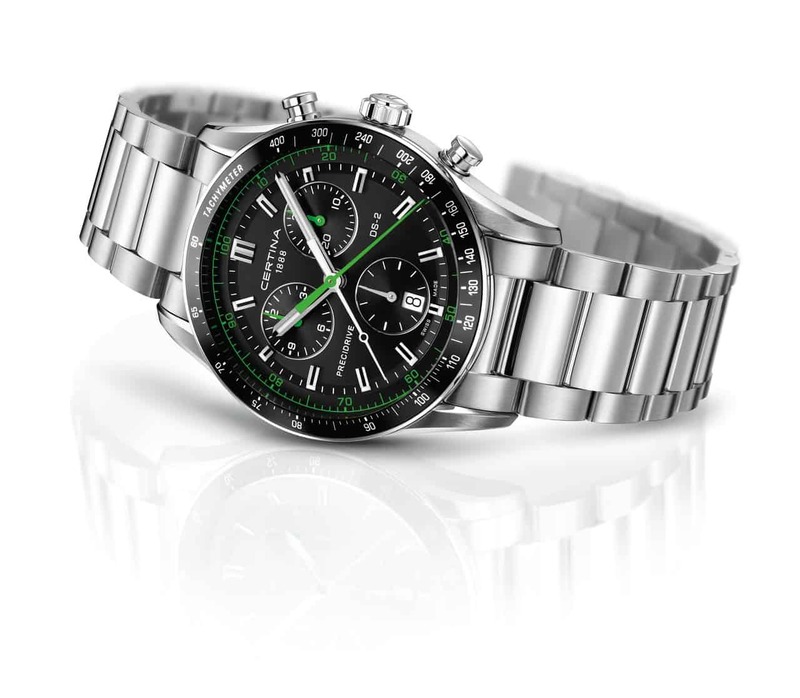 For my chronograph HAQ selection, I’ll go with Certina’s DS-2 Chronograph, which uses an ETA Precidrive movement to achieve its plus or minus 20 seconds a year rating. A well-proportioned 41mm case uses green accents, including the seconds hand, 12-hour and 30-minute sub-dial hands being green, along with the split seconds indicator and chapter ring. Certina uses an integrated circuit to measure the quartz crystal’s temperature and keep its accuracy to COSC standards. Li's first watch was a $105 Seiko 5 dress watch. That purchase started his obsession, though he has since moved a bit more upmarket. Today, Li is a fanatic for Seiko divers, both vintage and new, with a special appreciation for the Seiko Marinemaster 300m.